This year, your second grader will spend lots of time learning about commas, quotation marks, periods, and question marks. Here's a fun activity that will help your child become familiar with punctuation marks, using something straight from the cupboard... pasta! Have your child read a sentence aloud from his favorite book. To draw lots of attention to the punctuation, have him point to punctuation marks in the sentence, and place similarly-shaped pasta pieces on top of the written marks. Discuss what the effect of the punctuation mark is on the sentence. For example, quotation marks tell the reader when someone is speaking. They mark the beginning and the end of the words that a character says. Repeat this process for subsequent sentences. 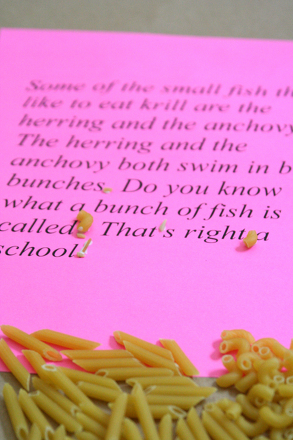 Once your child gets the hang of it, it's time for him to write on his own, using his punctuation pasta! Take the book you've been working with, and ask your child to write a new ending to the story. Remind him to include dialogue, questions, and exclamation marks. As he writes the story, ask him to place pasta pieces on the paper where he thinks the punctuation marks should go. When he's finished, discuss his punctuation choices with him. Ask him to explain why he's chosen to use question marks, commas, etc. When he's sure that's where the punctuation needs to go in his story, glue the pieces down to the page and hang his story up for all to see! What's going on? First, you're giving your child a hands-on chance to see how punctuation changes a sentence. Second, you're celebrating his growing ability to express himself clearly and to handle writing. These are skills that form a foundation for success for all the grades to come. And with silly pasta shapes, they're really fun to learn, too. Put proper punctuation into practise with these read-along stories. Put proper punctuation into practise with this Baby Sister read-along worksheet. Put proper punctuation into practise with this Bumble Bee read-along worksheet. Practise with punctuation perfectly in this punctuation worksheet. Can your child help punctuate this passage? He'll read an Aesop's fable and then add in the periods where they are missing in the story!